I was actually surprised that wind did not look even worse. I think the reason for this is in how the author deals with wind's reliability issues -- he ends up discounting the average capacity factor somewhat. But this understates the problem. The real reliability problem with wind is that it can stop blowing almost instantaneously, while it takes hours to spin up other sorts of power plants (gas turbines being the fastest to start up, nuclear being the slowest). Thus power companies with a lot of wind have to keep fossil fuel plants burning fuel but producing no power, an issue called hot backup. This issue has proved itself to substantially reduce wind's true displacement potential, as they found in Germany and Denmark. There is no evidence that industrial wind power is likely to have a significant impact on carbon emissions. The European experience is instructive. Denmark, the world's most wind-intensive nation, with more than 6,000 turbines generating 19% of its electricity, has yet to close a single fossil-fuel plant. It requires 50% more coal-generated electricity to cover wind power's unpredictability, and pollution and carbon dioxide emissions have risen (by 36% in 2006 alone). Flemming Nissen, the head of development at West Danish generating company ELSAM (one of Denmark's largest energy utilities) tells us that "wind turbines do not reduce carbon dioxide emissions. " The German experience is no different. Der Spiegel reports that "Germany's CO2 emissions haven't been reduced by even a single gram," and additional coal- and gas-fired plants have been constructed to ensure reliable delivery. Indeed, recent academic research shows that wind power may actually increase greenhouse gas emissions in some cases, depending on the carbon-intensity of back-up generation required because of its intermittent character. 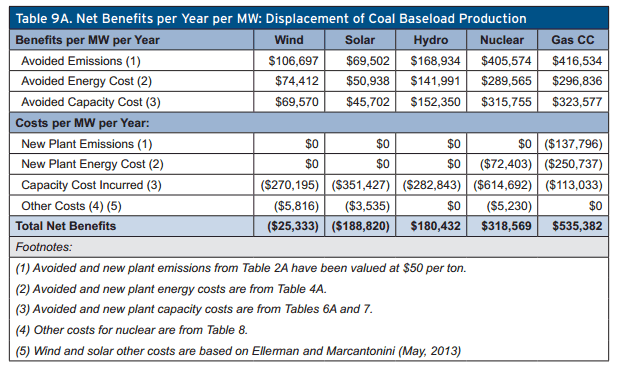 ** Postscript: The best way to read this table, IMO, is to take the net value of capacity and energy substitution and compare it to the CO2 savings value. The first line is just from the first line of the table above. The second is essentially the net of all the other lines. I think this makes is clearer what is going on. For wind, we invest $106,697 for $132,030 $132,030 for $106,697 in emissions reduction (again, I think the actual number is lower). In Solar, we invest $258,322 for $69,502 in emissions reduction. For gas, on the other hand, we have no net investment -- we actually have a gain in these other inputs from the switch -- and then we also save $416,534. In other words, rather than paying, we are getting paid to get $416,534 in emissions reduction. That is not several times better than Solar and Wind, it is infinitely better. Postscript #2: Another way to look at this -- if you put on a carbon tax in the US equal to $50 per ton of CO2 that fuel would produce, then it still likely would make no sense to be building wind or solar plants unless there remained substantial subsidies for them (e.g. investment tax credits, direct subsidies, guaranteed loans, above-market electricity pricing, etc). What we would see is an absolute natural gas plan craze. On the right, both climate change and questions about global limits on oil production have exited the realm of empirical debate and become full-blown fronts in the culture wars. You're required to mock them regardless of whether it makes any sense. And it's weird as hell. I mean, why would you disparage development of renewable energy? If humans are the ultimate creators, why not create innovative new sources of renewable energy instead of digging up every last fluid ounce of oil on the planet? I am sure it is perfectly true that there are Conservatives who knee-jerk oppose every government renewable energy and recycling and green jobs idea that comes along without reference to the science. But you know what, there are plenty of Liberals who knee-jerk support all these same things, again without any understanding of the underlying science. Mr. Drum, for example, only recently came around to opposing corn ethanol, despite the fact that the weight of the science was against ethanol being any kind of environmental positive years and years ago. In fact, not until it was no longer cool and caring to support ethanol (a moment I would set at when Rolling Stone wrote a fabulous ethanol expose) did Drum finally turn against it. Is this science, or social signalling? How many folks still run around touting electric cars without understanding what the marginal fuels are in the electricity grid, or without understanding the true well-to-wheels efficiency? How many folks still run around touting wind power without understanding the huge percentage of this power that must be backed up with hot backup power fueled by fossil fuels? Why is his almost blind support of renewable energy without any reference to science or the specifics of the technologies involved any saner than blind opposition? If anything, blind opposition at least has the numbers on their side, given past performance of investments in all sorts of wonder-solutions to future energy production. The reason there is a disconnect is because statists like Drum equate supporting government subsidies and interventions with supporting renewables. Few people, even Conservatives, oppose renewables per se. This is a straw man. What they oppose are subsidies and government mandates for renewables. Drum says he has almost limitless confidence in man's ability to innovate. I agree -- but I, unlike he apparently, have limitless confidence in man's ability to innovate absent government coercion. It was not a government program that replaced whale oil as an illuminant right when we were approaching peak whale, it was the genius of John D. Rockefeller. As fossil fuels get short, prices rise, and people naturally innovate on substitutes. If Drum believes that private individuals are missing an opportunity, rather than root for government coercion, he should go take up the challenge. He can be the Rockefeller of renewable energy. Postscript: By the way, it is absurd and disingenuous to equate opposition to what have been a series of boneheaded government investments in questionable ventures and technologies with some sort of a-scientific hatred of fossil fuel alternatives. I have written for a decade that I long for the day, and expect it to be here within 20 years, that sheets of solar cells are cranked from factories like carpet out of Dalton, Georgia. Just days after the Export-Import Bank approved a multi-million dollar federal loan guarantee to benefit a mostly foreign-based wind-energy outfit, the company pink-slipped more than 200 American workers. The Export-Import Bank, a federal agency that promotes and finances sales of U.S. exports to foreign buyers, approved a $32 million loan guarantee on Aug. 2 for a Brazilian firm to purchase wind turbines from LM Wind Power. According to itswebsite, LM Wind Power is headquartered in Denmark. “Ex-Im Bank’s financing, which guarantees a Bank of America loan, will support approximately 250 permanent American jobs at the company’s Little Rock, Ark., and Grand Forks, N.D., manufacturing facilities,” the bank said in a release. The company maintains a manufacturing presence in Arkansas and North Dakota—but the company laid off 234 of the Arkansas plant’s roughly 300 workers just two days after its loan was approved. “We have this week told our workforce that we are re-sizing our workforce and business to fit our plans for 2013,” Adam Ruple, human resources director for LM Wind Power, told the City Wire of Arkansas. A spokesman for LM Wind Power referred the Free Beacon to the company’s website. When LM Wind Power came to Little Rock, Arkansas, in 2007, it said it would employ 1,000 people by 2012. But the global economic crunch led to diminishing demand. Three months before its loan guarantee was finalized, LM Wind Power announced its profits had fallen 41 percent last year. It really takes some amazing stones to grab a $32 million subsidized government loan on the promise to add 250 jobs just days before a planned 234-person layoff. Every single time that wind power installations are evaluated based on their actual performance, they turn out to make no economic sense. Consumer Reports comes to the same conclusion for their wind power trial (and this does not even include the issues of standby power that make even small wind power savings irrelevant to CO2 production). A tool on Windtronics' website had calculated we'd get 1,155 kWh per year at the 12-mph average it predicted for our area of Yonkers, New York. And the authorized installer, during his initial visit, didn't say the roof of our headquarters might generate any less, but that rating is at a height of 164 feet, not the 33 feet WindTronics requires for rooftop installations. At the rate the WT6500 is delivering power at our test site, it would take several millennia for the product to pay for itself in savings—not the 56 years it would take even with the 1,155 kWh quote we received. One thing that many green energy advocates fail to understand is the very scale of US energy demand in relation to the output of various green sources. The Keystone XL pipeline would have provided 900,000 barrels of oil per day, roughly equivalent to 1.53 billion kw-hr per day. A typical wind turbine is 2MW nameplate capacity, but at best actually produces about 30% of this on average. This means that in a day it produces 2,000*.3*24 = 14,400 kw-hr of electricity. This means that the Keystone XL pipeline would have transported an amount of energy to the US equal to the output of 106,250 of those big utility-size wind turbines. Looked at another way, the entire annual output of the US wind energy sector was about 75 terra-watt-hours per year or about 260 million kw-hr per day. This means that the Keystone XL pipeline would have carried energy equal to over 5 times the total output of wind power in the US. Of course, this is just based on the potential energy in the fuel, and actual electricity production would be 50-65% less. But even so, this one single pipeline, out of many, is several times larger than the entire wind power sector. Wind is not the worst form of alternative energy -- that probably has to go to corn ethanol. But it is close. The consistent experience of European countries that have more wind power than the US is that, because wind is so unreliable, hot backup fossil fuel generation capacity nearly equal to wind capacity needs to be maintained. This means that even when the wind is blowing, it is not reducing fossil fuel consumption in any meaningful way. In other words, billions are spent on wind but without any substitution of existing power sources. Its just pure wasted money. Anyway, here is a recent study by an environmental group, no less, that found that Britain's wind generation plants are running well under the promised efficiency. That is, of course, when they are even operable and not just broken down. In the latter case, companies go for the quick bucks of up front subsidies, then find that the units are not worth the repair costs when they break. Forget all of the studies for a moment. I used to operate power plants. Any traditional capacity (fossil fuel, nuclear) except perhaps gas turbines takes on the order of a day or more to start up - if you don't take that long, the thermal stresses alone will blow the whole place up. During the whole startup and shutdown, and through any "standby" time, the plant is burning fuel. Since we don't have a good wind energy storage system, some percentage of wind capacity must be backed up with hot standby, because it can disappear in an instant. We are learning now, contrary to earlier assumptions, that wind speeds can be correlated pretty highly over wide geographies, meaning that spreading the wind turbines out does not necessarily do a lot to reduce the standby needs. And since plant startups take time, even gas turbines take some time to get running, the percentage of wind power that required hot backup is pretty high -- I would love to find this percentage. It is hard to tell, because 48,000 MW is the nameplate capacity which is virtually meaningless, but my guess is that they are not doing better than 80%. The other day I was happy to see lefty Kevin Drum pointing out the obvious problems with subsidizing Edit Post "¹ Coyote Blog "â WordPressethanol. This is a step forward, when smart people on both sides of the aisle can agree that a certain approach is dumb. Of course, given the incentives in government, that doesn't mean that ethanol subsidies will actually stop. So we make some progress on ethanol, but just replace it without another absurdly dumb subsidized energy technology, in this case wind. Wind is not even close to being ready for grid service, and given the hot backup power one needs to cover its unpredictability, it does about zero to reduce CO2 emissions. A series of studies have shown that it has done nothing to reduce fossil fuel consumption in either Germany or Denmark. And the whole green jobs thing is even more absurd -- it makes no sense theoretically, as shifting private investment to less economically viable uses has never, ever created jobs -- and has been debunked in practice in both Denmark and Spain. Unfortunately, the Obama administration has bent over backwards to ignore the science and push wind, for no other reason I can figure out except to avoid admitting he was wrong when he campaigned on wind. This makes for a pretty depressing story, and, given there are more documents the Administration is resisting releasing under FOIA, probably more ugly news to follow. Postscript: One way you could use wind is with some kind of storage system, of which I can think of two. The first is to use wind to pmp water up hill into a reservoir where the potential energy could later be harvested as hydroelectric power. The other is to use the wind power to make hydrogen from water. You need some sort of process that can be stopped and started on short notice. I have an innate confidence in technology. For example, while I understand solar to be uneconomic for powering my house today, I fully expect that to change. I look forward to the day, not that far in the future, when I can take my Arizona house off the grid, at least during the day. In contrast, though, it may be that wind power can't be fixed, in large part due to its inherent unpredictability. Sure, solar has a problem as well, in that it doesn't work at night. But at least the times when solar is off here in Arizona (ie when it is dark) are predictable and coincide with lower load periods. Wind is utterly unpredictable and variable, and its peaks and troughs are unrelated to peaks and troughs in electricity demand. So, if the grid is to reliably supply sufficient power to meet demand, wind must have a backup. And there is the rub. Because just about every technology that might currently be used as a backup takes a really, really long time to start up. Small gas turbines can be producing electricity from a cold stop pretty quickly, but a large coal-fired power plant can take days to go from a cold stop to producing electricity. This is in part because there are a series of steps where A has to precede B which must come before C to start plants up, and partially just because immediately heating the whole system up would cause the plant to blow up just from the thermal stresses. So, to back up wind power, traditional fossil fuel plants have to be kept warmed up with turbines spinning. This means that fossil fuels are burned but no electricity is produced. I mentioned in a previous post that the largest utility in Germany estimated that 48,000MW of wind capacity was in fact allowing the shut down of just 2000MW of traditional fossil-fuel powered capacity. A recent article in the National Post argues the Danes are seeing absolutely no substitution from their substantial investment in wind. Flemming Nissen, the head of development at West Danish generating company ELSAM (one of Denmark's largest energy utilities) tells us that "wind turbines do not reduce carbon dioxide emissions." The German experience is no different. Der Spiegel reports that "Germany's CO2 emissions haven't been reduced by even a single gram," and additional coal- and gas-fired plants have been constructed to ensure reliable delivery. It probably comes as no surprise that the Danes have the highest electricity costs in Europe. The article goes on to call wind power in the US a "huge corporate welfare feeding frenzy." Ditlev Engel, president and chief executive of the Danish wind-energy company Vestas, said anecdotal evidence about birds being caught in turbine blades and other environmental horror stories do not usually hold up under scrutiny. "Do people think it's better all those birds are breathing CO2? I'm not a scientist, but I doubt it," said Engel, whose company is expanding its U.S. manufacturing and distribution operations. "Let's get the facts on the table and not the feelings. The fact is, these are not issues." I am always amazed at the number of environmentalists that laud the Brazilian ethanol push, given the out-sized effect that industry has had in carving up the Amazon rain forest. As a disclosure, I am a member of the Nature Conservancy, and wild land preservation is my environmental interest of choice, though I prefer to pursue it through private means (ie via private purchases of land for conservation purposes). The Nature Conservancy used to spend most of its money for this purpose, though of late it has diverged, as so many environmental groups have, into lobbying government to force people to achieve its ends for them rather than to pursue these ends through non-coercive means. Provisions That Made the Bailout "Better"
Here are some of the provisions in the bailout that converted "no" votes to "yes." Unbelievable. * Sec. 105. Energy credit for geothermal heat pump systems. * Sec. 111. Expansion and modification of advanced coal project investment credit. * Sec. 113. Temporary increase in coal excise tax; funding of Black Lung Disability Trust Fund. * Sec. 115. Tax credit for carbon dioxide sequestration. * Sec. 205. Credit for new qualified plug-in electric drive motor vehicles. * Sec. 405. Increase and extension of Oil Spill Liability Trust Fund tax. * Sec. 309. Extension of economic development credit for American Samoa. * Sec. 317. Seven-year cost recovery period for motorsports racing track facility. * Sec. 501. $8,500 income threshold used to calculate refundable portion of child tax credit. * Sec. 503 Exemption from excise tax for certain wooden arrows designed for use by children. same way they cover physical health.